I am happy that I spent the last days of 2015 reading this awesome book. It’s my very first from V.E. Schwab and she is now officially on my favorite author list. Actually, she’s already on my list right after I bought this this book and after she liked/retweeted my post. She’s so nice and I love her. 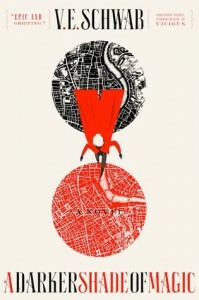 A Darker Shade of Magic introduces us to Kell, a guy with a cool coat who can travel back and forth between different Londons – Grey London (magic-less and boring city), Red London (city where Kell is from), White London (city ruled by the flawlessly evil twins) and Black London (the dead but not forgotten city). He is the ambassador and adopted prince of Red London. He also has a dangerous/forbidden hobby and because of this, he got into a huge trouble. 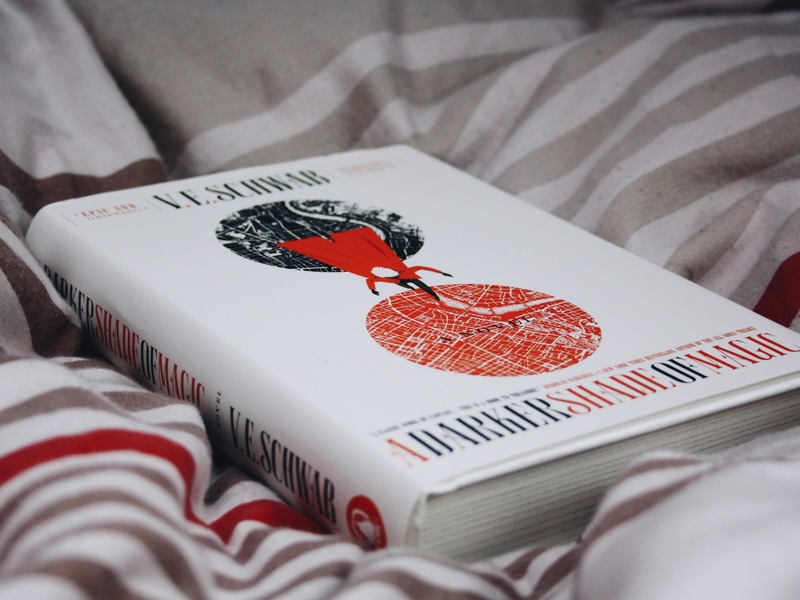 While he is in Grey London, he runs in to a thief named Lila Bard and that’s when their adventure begins. I started reading this book without having any idea what I’m diving in to and ended up loving it. The characters are compelling and I like all of them, even the bad ones. Kell is not a perfect guy. He is a badass but a loving, good guy but also has a “dark” side. Being “distinct” and having no idea about his past makes him feel more lonely and out of place. He makes mistakes but he does everything to fix them. I adore his relationship with Rhy, his bestfriend/brother. Lila Bard, a cross-dresser thief and pirate wannabe, is one of my favorite characters in this book. I love her attitude and eagerness to get what she wants, even in a crazy and bad ways. She’s also funny and has a good taste with weapons. There is no clear “romance” between Kell and Lila but I still ship them. I think they’ll make a really great team/couple based on the adventures they’ve been through. I’ve been hearing so many great things about Schwab’s novels and I totally get now why. Her writing style is astounding and the world building is remarkable. Others might find the first 100 pages a bit slow but I’m okay with it. The concept of having more than one London is fascinating and I also like Schwab’s idea of magic. I like how she described the differences of the four Londons including their features, customs, dialects and even the smell. They felt all so real. This can be a standalone book because it ended so good but I cannot deny that I still want more of Kell and Lila’s adventures. I’m so excited for A Gathering of Shadows. A Darker Shade of Magic is captivating, entertaining and easy to read. I highly recommend this to everyone. Also, I just started reading more fantasy books last year so if you are like me who is quite new to this genre, this book is perfect for you.